James Collier's Instagram series features large farms shot from above. Who knew monoculture could be this beautiful? I’m a huge agriculture nerd. At no point is this fact more evident than on long drives through California’s farm country. Yes, I’m that person who notices when the almond trees give way to a pistachio orchard and calls out, “pistachios!” as if the other people in the car will care. But this deep-seated love of crop-spotting is only one of the many reasons James Collier’s series of farm landscape images recently caught my eye. Shot from several hundred feet above ground using a drone, Collier’s farmland images will probably make you want to guess what’s growing below. But their vantage point also lends them an abstract, textural quality. And they offer the viewer a quick—and at times overwhelming—sense of the scale involved in today’s farmscapes. Collier calls New York City his home, but for over a decade he lived in Fresno, where he ran a food community website called Taste Fresno and got to know a number of local food producers. He still travels the country often and recently photographed dozens of restaurants for James Beard’s All-American Eats: Recipes and Stories from Our Best-Loved Local Restaurants. 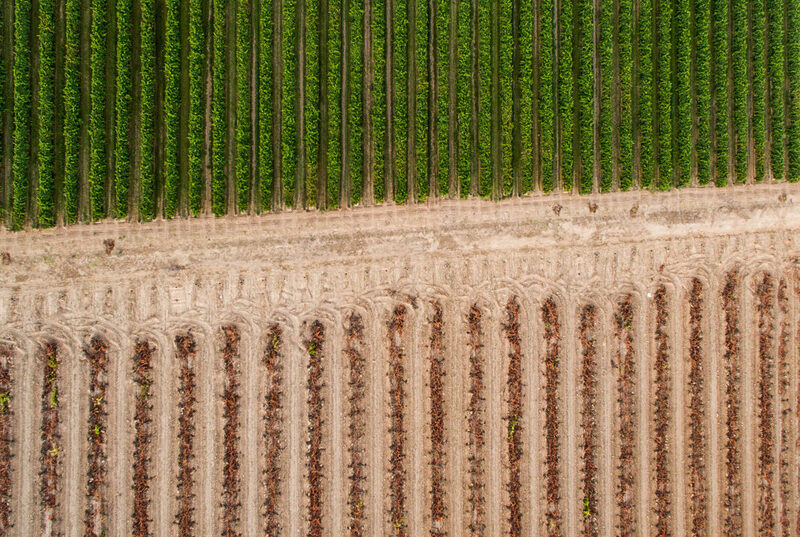 Last summer while spending an extended period back in the Central Valley, a farmer friend asked Collier to photograph a newly acquired plot from above. While he was there, took a few shots of the neighboring almond farm—and the result was an image he realized wouldn’t be immediately recognizable as almond trees. “I got hooked,” he recalls. And since then Collier has sent his drone up to shoot similar images in several parts of California, as well as Louisiana, Pennsylvania, and North Carolina. “Any time I’d be driving by any type of agricultural land, I’d have the drone with me and I’d stop,” he says. He calls the series “woven,” because of the way the farm fields often remind him of fabric. “At that altitude you can still identify the crops, but it starts to look like a texture that has been woven together,” he says. Collier has been posting the images to his Instagram account since last summer. The photographer says the series is mainly a personal project for now, but he may one day want to collect them in a book alongside short interviews with farmers to add a human element to the images. Collier takes pride in creating images that disorient his audience (“mindfuckery” is the precise word he used). But he also has grander hopes for what that disorientation might yield. Almonds in Raisin City, California. The trees to the left were a few years old, and on the right are new plantings. Canola, near the Outer Banks in North Carolina. Tomato fields (on the left) near Modesto. Ethiopian blue emmer wheat in Firebaugh, Calif. Netted blueberries and young stone fruit trees in Dinuba, California. beautiful and tragic at the same time.